​Fort Concho, established in 1867 at the forks of its namesake river, served as a United States Army outpost to protect isolated settlers and campaign against Native American tribes in the region. When Bartholomew DeWitt purchased 320 acres for development near Concho on a loan on which he later defaulted in 1875, his creditor Marcus Koenigheim ended up owning most of what would become San Angelo. Koenigheim lived in San Antonio, and though his luck marked the beginning of a Jewish influence in San Angelo, he first considered it a misfortune. Saddled with a frontier community graced by saloons, gambling and prostitution, Koenigheim once sought to trade his business blunder for a barrel of whiskey. He was refused and told the whiskey was more valuable. San Angelo’s prospects improved by the 1880s however; it became the seat of Tom Green County after a flood decimated nearby town Ben Ficklin and was aided economically by the construction of the Santa Fe Railroad in 1888. As a burgeoning center for agriculture and ranching in West Central Texas, Jews prospered in San Angelo throughout the next century, influencing the city far beyond their small numbers. Jewish merchants had their businesses. The first Jews who moved into San Angelo worked as merchants, dry goods salesmen, and sutlers. The San Angelo Standard newspaper reported on the closing of Jewish businesses for High Holidays as early as 1884. Trader Joseph Loeb is likely the first Jew to arrive in San Angelo, establishing a partnership with William S. Veck, but leaving for another outpost during the 1870s. Schwartz & Raas, owned by Louis Schwartz and Joseph Raas, was an early Jewish mercantile business, and their building is one of the oldest permanent structures in the city. Raas, born in France, worked in San Angelo for a number of years before returning to California to run a wine house after the business closed in 1894. Polish-born Samuel and Jacob Lapowski made their way to San Antonio and opened a chain of dry goods stores in West Texas. The San Angelo store was “the biggest general merchandise firm in West Texas” according to the Standard. Though he came from Russian Jewish stock, the Lapowski family quickly assimilated into American society. Samuel married a Swedish Lutheran immigrant, raised his children as Protestants and changed the family’s last name to “Dillon.” With S. Lapowski and Bro. making large earnings in the growing city, Samuel later sold out and left San Angelo. His son Clarence later worked with the prominent Wall Street banking firm, Dillon, Read & Co. and became one of the richest men in the United States. His son C. Douglas Dillon was ambassador to France, Secretary of Treasury under Kennedy and Lyndon Johnson, and chairman of the Rockefeller Foundation and the Brookings Institution. Not all the area’s Jews made their living in shopkeeping. Although he married a Gentile and took up her religion, Sol Mayer distinguished himself as one of Texas’ Jewish cowboys. Working in his father’s San Angelo store and learning to be a ranch hand as a teenager, he helped found F. Mayer & Sons and bought the T-Half Circle Ranch in Schleicher and Sutton counties. Sol was instrumental in the creation of the San Angelo National Bank and served as its president, built a telephone line from San Angelo to Sonora, and donated a portion of his ranch in McKavett for a Boy Scouts Camp that still bears his name. The Angelo State University administration building is also named for Mayer. Beth Israel's synagogue, built in 1928. By 1910, San Angelo’s population stood at 10,000. 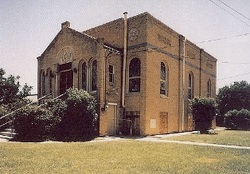 With only 20 Jews residing in the city in 1912 according to the American Jewish Yearbook, a congregation, Beth Israel, was formally chartered in 1913. Beth Israel held services in local public buildings and hotels. Yeshiva-educated David Goldman, a local real estate agent known as “Rabbi Dave,” served as lay leader during the time, conducting services every Friday night and for the High Holidays. By 1930, the city’s population had increased to over 25,000 with around 80 Jews. Max Weinberg, who moved to San Angelo with his family in 1926, pushed for a permanent house of worship. This dream was realized in 1927 when local businessman H.C. Ragsdale provided a lot for its construction. Temple Beth Israel, a small two-story structure located on West Beauregard street, was ready for services the following August. Its March 1929 dedication was attended by San Angelo’s mayor and Christian ministers, and was broadcast over a local radio station. More Jewish families had settled in San Angelo by the construction of San Angelo’s temple, including the Gorens, Cohens, Stools, and Robinsons. New Jewish businesses, such as Fine’s, the Maurice Shop, Ray & Willick and the Boston Store, had opened. The Donsky family was one of the most successful of the new Jewish merchants. Nathan Donsky arrived in 1927 shortly after graduating high school in Dallas to operate concessions for the San Angelo Sheepherders, the city’s short-lived semi-professional baseball team. He left San Angelo after the team folded, but returned in 1930 and accepted a partnership with jeweler Leon Fine. After Donsky opened Nathan’s Jewelers in 1939, his operation expanded into several Texas towns with the help of his brother Abe “Honey” Donsky, who, according to legend, was once held up by Bonnie and Clyde. Nathan was widely known for his philanthropy in San Angelo, and served as a head of the San Angelo Chamber of Commerce. 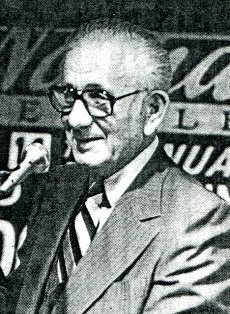 He was elected the city’s citizen of the year in 1978. The temple never formally affiliated with a particular branch of Judaism. Nevertheless, the community was active in a number of Jewish civic and religious organizations. A chapter of Young Judea, a Zionist youth organization, formed in the late 1920s and ran until at least 1931, and a B’nai B’rith chapter began in 1946. Beth Israel also served Jewish soldiers from nearby Goodfellow Air Force Base. The temple offered Sunday school classes, though the building only had one classroom. Classes also met in the kitchen, sanctuary, and the meeting hall. Beth Israel hired David Schnayerson to lead services and teach Hebrew in 1951. San Angelo’s first and only rabbi, Schnayerson served the congregation until his death in 1971, and is buried in Lawnhaven Cemetery’s Jewish section in San Angelo. The city’s Jewish population peaked at approximately 125 during the 1970s. Since then, numbers have declined to less than 20 by 2000. Nevertheless, maintaining their tradition is important for the handful of Jewish families in the area. Lay services are still held every Friday night and for High Holidays, and the first bat mitzvah since 1960 was held in 2008.